The sixth entry in Sega's long running Initial D series of arcade street racers. The game includes a new two-on-two "tag battle" feature. The game runs on the Ringedge hardware. The game runs on the Ringedge hardware. 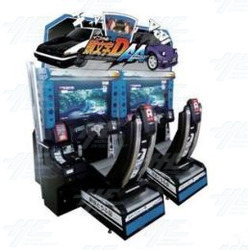 Gameplay of the Initial D6 driving arcade machine by Sega. This short video, made in store at Highway Entertainment, shows a person playing the machine in race mode.